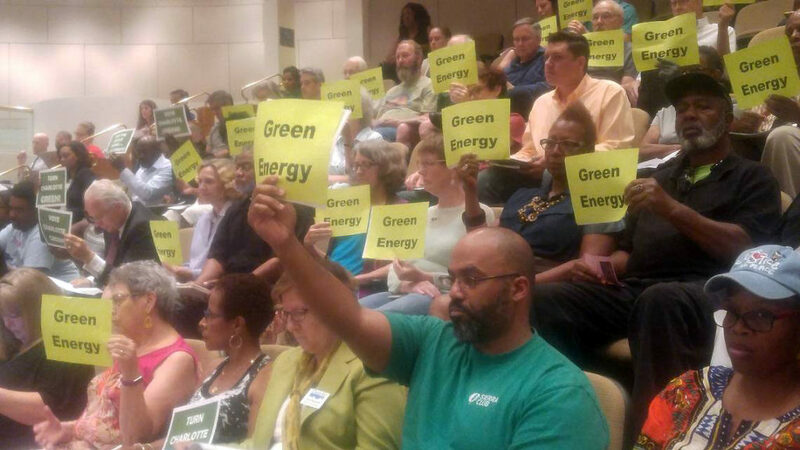 Citizens in Charlotte, North Carolina come out in large numbers to ask city council members to adopt a resolution to move to 100% clean, renewable energy by 2050. Council members adopted the resolution! Our mission is to identify and implement solutions to avert climate catastrophe. We do this by bringing together diverse climate organizations and people to support, accelerate, and amplify their work. We provide tools to empower local communities and individuals to take urgent action – especially in support of vulnerable and fragile communities – to create green jobs and to rapidly transition to a 100% clean, sustainable, renewable energy economy. The North Carolina Climate Solutions Coalition, or NCCSC, recognizes that by 2020, as leading climate scientists agree, we must be well on our way to eliminating fossil fuels and transitioning to 100% clean energy in all energy sectors. Without this energy transformation, climate change threatens the survival of all life on Earth. At NCCSC we have a sense of urgency to share and implement solutions in collaboration with scientists; faith, social justice, business, and environmental leaders; and elected officials to create the “critical mass” needed at this urgent juncture in human existence. NCCSC and our partners are organizing town hall meetings, university symposiums, and clean energy policy briefings for elected officials to explain the urgency of action needed to avert climate catastrophe and to deploy renewable energy such as solar and wind. NCCSC’s work includes a campaign to pass 100% clean and renewable energy legislation on local, state, and federal levels. We have passed sixteen clean energy resolutions in the state of North Carolina through 2018, including in the city of Charlotte, the second fastest growing city in the nation. This energy transformation will create scores of clean energy jobs, it will lower the rate of mortality due to the many air and water pollutants associated with fossil fuels, and it will improve security for our state and our nation. NCCSC is working with Members of Congress and leading climate scientists and experts to develop a national gold standard 100% clean energy bill to be introduced this year. Rep. Ted Lieu (D-CA) will also be introducing a bill to solarize Puerto Rico this fall that NCCSC has helped to develop. We believe Puerto Rico will serve as a shining example of a clean energy transformation success after the energy disaster caused by fossil fuel-driven Hurricane Maria. We encourage you to join our ranks and become a clean energy advocate. NCCSC firmly believes that every individual, every grassroots organization, and every voice can make a difference in helping avert climate disaster for our country. Sign up for the NCCSC newsletter and become a change maker in YOUR community!